Here are the ratings for Duets, the ABC singing competition that pairs Kelly Clarkson, John Legend, Robin Thicke, and Jennifer Nettles with aspiring singers. 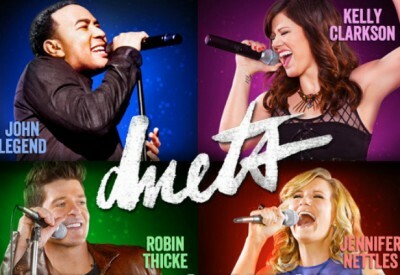 The first season of Duets typically airs Wednesday or Thursday nights on the ABC network. These are the TV show’s ratings for the 2011-12 season, the best way to tell if Duets is going to be cancelled or renewed for season two. Check out our ABC summer ratings report card to see how this show’s numbers compare with the others on the network. Final season averages: 1.2 rating in the 18-49 demographic with 4.93 million total viewers. 1.0 in the demo (0% episode-to-episode change) with 4.48 million. Season averages: 1.19 in the demo with 4.93 million. 1.0 in the demo (0% episode-to-episode change) with 4.73 million. Season averages: 1.21 in the demo with 4.99 million. 1.0 demo rating (0% episode-to-episode change) with 4.77 million. Season averages: 1.24 in the demo with 5.02 million. 1.0 in the demo (-17% episode-to-episode change) with 4.30 million. Season averages: 1.28 in the demo with 5.06 million. 1.2 in the demo (+9% episode-to-episode change) with 4.19 million. Season average: 1.34 in the demo with 5.22 million. 1.1 in the demo (-8% episode-to-episode change) with 3.95 million. Season average: 1.38 in the demo with 5.47 million. 1.2 in the demo (-20% episode-to-episode change) with 5.27 million; third in the timeslot. Season average: 1.47 in the demo with 5.98 million. 1.5 in the demo (-12% episode-to-episode change) with 5.92 million. Season average: 1.60 in the demo with 6.34 million. 1.7 rating in the 18-49 demographic with 6.76 million total viewers. Season average: 1.70 in the demo with 6.76 million. It was an unimpressive start for this new series. It was in third place at 8pm and in second place for the remainder of the half hours, beaten by FOX’s So You Think You Can Dance by 29% in the demo. It may be that America is tiring of singing competitions or at least that they’re not ready to embrace another one so soon after the finales of The Voice and American Idol. Perhaps the network would have benefited from waiting a few weeks to premiere this one. What do you think? Do you like the Duets TV series? Do you think it should be cancelled or renewed for a second season? How does it compare to others in this genre? Bring Duets back everyone in my household loved it ! Bring Duets back, all my kids loved it and so did their mom and me. just give it more time, it will be bigger than American Idol. Please bring back “Duets”…. It deserves another chance!!! I love Jennifer Nettles and Kelly Clarkson. Please do not cancel this show. It is better than the other singing shows. Loved Duets-PLEEEEZE bring it back! Needs more time for people to discover. All were good, but especially enjoyed J. Nettles. We need more fun, entertaining & informative shows! I loved Duets You didn’t give it enough time. Most people I talked to didn;t even know it existed. Please bring it back. What a refreshing show for families to watch together. We desperately are in need of good family entertainment. This show was unique and I loved having the stars sing with their counterparts. This show was what I call quality entertainment. Lets do away with all the violence and sexual shows on TV. I plead with you help clean up our society and this is a great place to start right here on your network! Excellent Show! Very Unique and professionally done.